Here is what I have created from the stack of fabrics that I picked out yesterday. Expect to see more of these, I'm having fun with this pattern. Love the combination! Are you putting these in your shop? Awesome!! Love how that turned out! Also loving the reds…as cute as the pink and barkcloth are, this is more up my alley!! Three words, Suzy…FAB U LOUS! I love it! I’ll bet I could even fit my iPad in that! That seems to be my main criteria right now. Beautiful! You are such an artist with fabric! 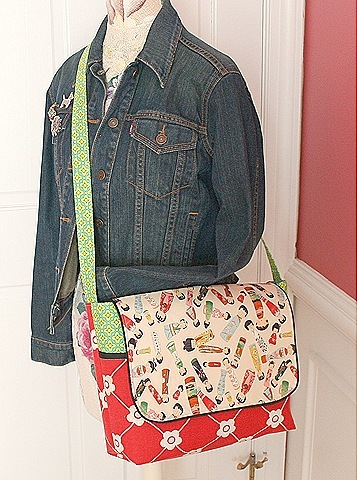 This pattern is a great way to show off your great taste in fabric. awesome bag! I love the mix of patterns! You have a unique way of expressing yourself. Love it. Your renovation is wonderful.